Sorry, but these links are badly in need of reviewing and updating. I hope to get around to it soon. For enquiries or to order, click here. 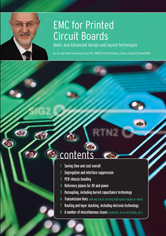 This book is for electronic circuit designers, as well as for PCB designers themselves, and has full-colour figures throughout. All application areas are covered, from household appliances, commercial, industrial and medical equipment, through automotive to aerospace and military. This book describes the techniques, and when they are appropriate, in practical engineering language. It does not describe why they work in great detail, and only uses a few simple maths formulas where they are practically useful. However, these techniques are very well proven in practice and the reasons why they work are well understood. The many web-based references lead to detailed explanations and mathematical foundations. It is difficult for textbooks to keep up to date with PCB technology and EMC techniques, which is why most of the references are conference papers and articles written during the last few years. Although the subject is EMC, many of the techniques are essential for achieving good SI or S/N and such issues are often discussed – especially in the few areas where EMC and SI requirements could conflict. 3.1.1 What do we mean by ‘chassis’? 3.1.2 What do we mean by ‘bonding’? 3.2 Why bond PCB 0V planes to chassis anyway? 3.5.4 What if we can’t use enough bonds? 5.2.1 Which circuit locations need decaps? 5.2.3 How much decoupling capacitance to use?